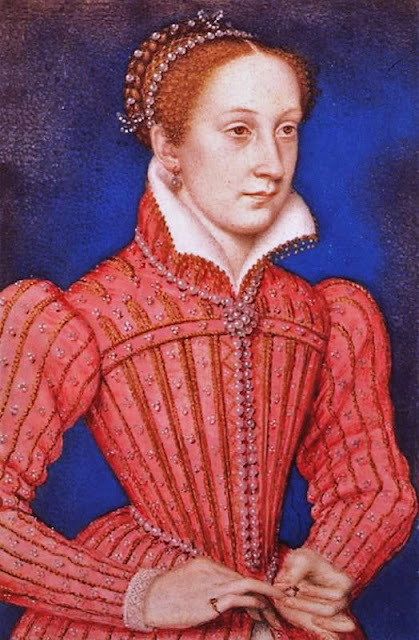 Mary, Queen of Scots (1542–1587), also known as Mary Stuart or Mary I of Scotland, was queen regnant of Scotland from 1542-1567 and queen consort of France from 1559-1560. 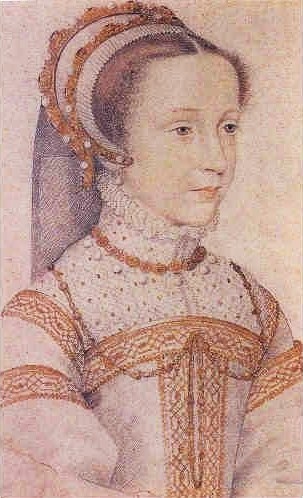 Mary was the only surviving legitimate child of King James V of Scots. She was 6 days old when her father died; and she was crowned 9 months later. 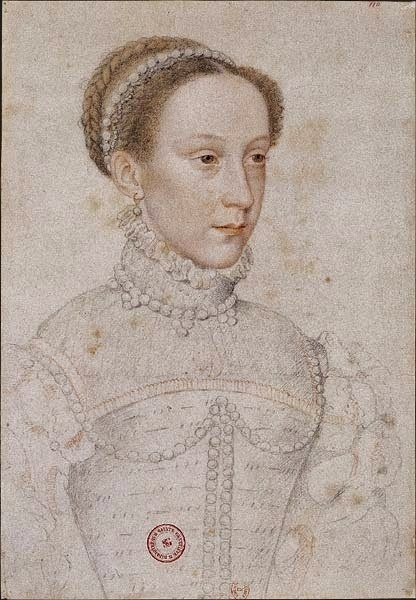 In 1558, when she was 16, she married Francis, Dauphin of France. He ascended the French throne as King Francis II in 1559; and Mary became queen consort of France, until she was widowed in 1560 at the age of 18. 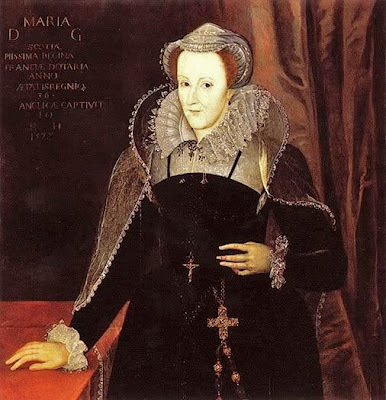 Mary then returned to Scotland, arriving in Leith in August 1561. Four years later, she married her first cousin, Henry Stuart, Lord Darnley. 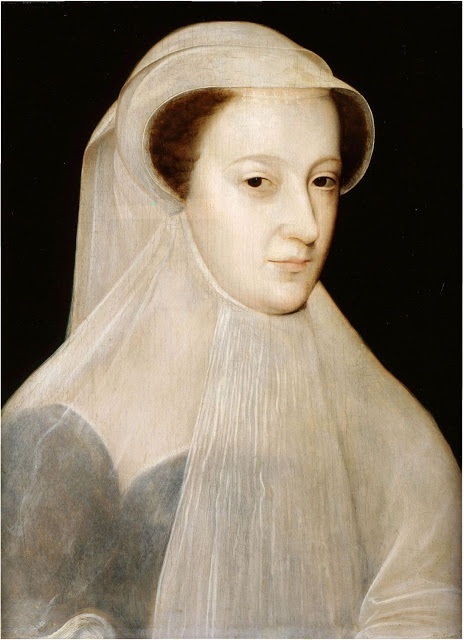 Their union was unhappy & in February 1567, there was a huge explosion at their house; where Darnley was found dead, apparently strangled, in the garden. 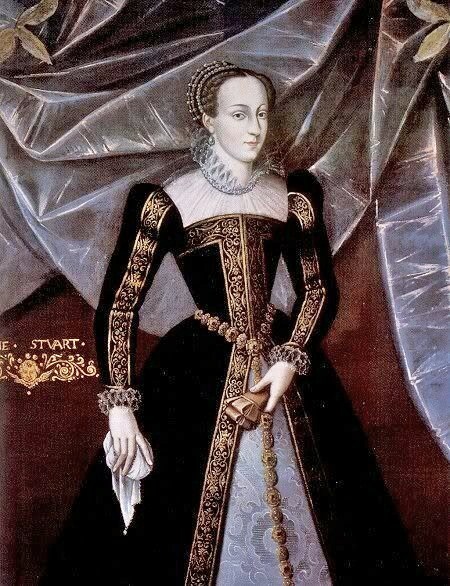 She soon married the 4th Earl of Bothwell, who was generally believed to be Darnley's murderer. Following an uprising against the couple, Queen Mary was imprisoned in Loch Leven Castle on 15 June 1567, & forced to abdicate in favour of her 1-year-old son, King James VI. After an unsuccessful attempt to regain the throne, Mary fled to England seeking the protection of her cousin Queen Elizabeth I of England. This may have been an unwise choice, as Mary had previously claimed Elizabeth's throne as her own & was considered the legitimate sovereign of England by many English Catholics. 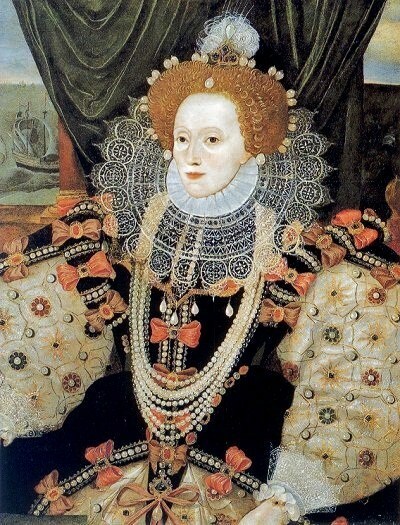 Perceiving her as a threat, Queen Elizabeth had her arrested. 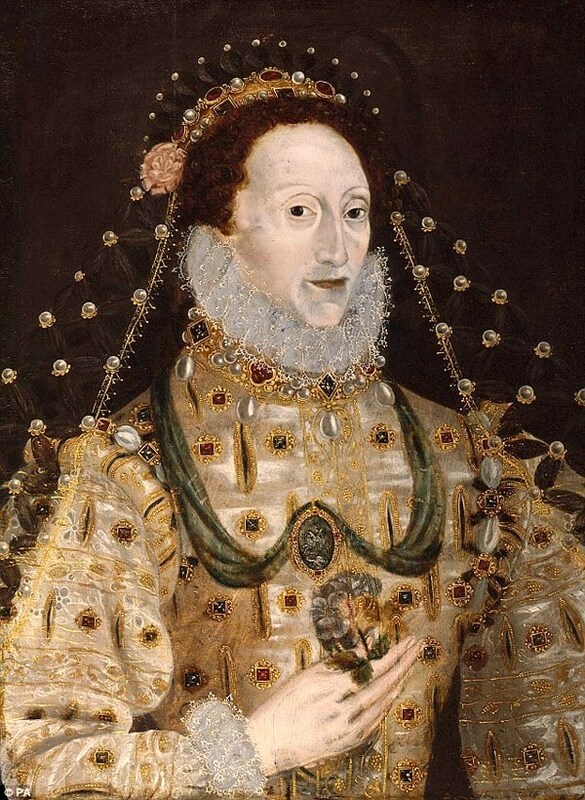 After 18 years & 9 months in custody in a number of castles & manor houses in England, Mary finally was tried & executed for treason for her alleged involvement in 3 plots to assassinate Queen Elizabeth I. Although Elizabeth signed the warrant for Mary's execution, Elizabeth tore it up. Advisors challenged her decision & another copy was signed- by someone- & immediately the council sent if off. Elizabeth was torn between protecting her throne & taking the life of a fellow sovereign & relative, even one she did not respect or like. Elizabeth I sent Mary, Queen of Scots a letter, written in French, at the opening of her trial at Fotheringhay on 12 October 1586. "You have in various ways and manners attempted to take my life and to bring my kingdom to destruction by bloodshed. I have never proceeded so harshly against you, but have, on the contrary, protected and maintained you like myself. These treasons will be proved to you and all made manifest. Yet it is my will, that you answer the nobles and peers of the kingdom as if I were myself present. I therefore require, charge, and command that you make answer for I have been well informed of your arrogance. Act plainly without reserve, and you will sooner be able to obtain favour of me. 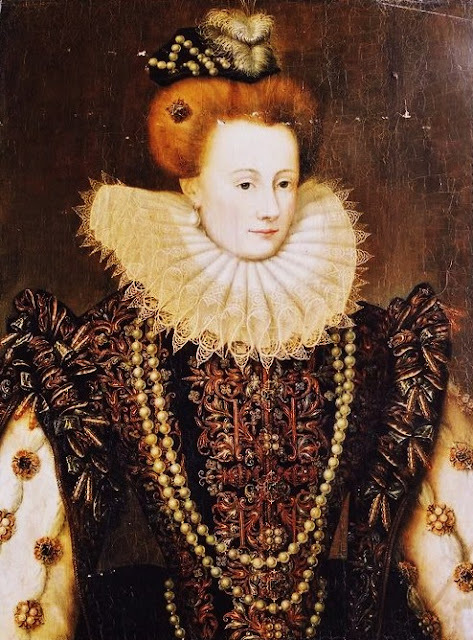 Elizabeth"
The second signed warrant was sent from London on 4th February, reaching Fotheringhay the following evening. On the 7th the Earls of Shrewsbury and Kent, who were in charge of the execution, warned Mary to prepare for death on the following day. On the 9th news of the execution reached London, and was received by the Queen with surprise and horror. She openly raged against her councilors. She sent her secretary Davison, who had given her the 2nd warrant, to the Tower. "Her prayers being ended, the executioners, kneeling, desired her Grace to forgive them her death: who answered, "I forgive you with all my heart, for now, I hope, you shall make an end of all my troubles. "Then they, with her two women, helping her up, began to disrobe her of her apparel: then she, laying her crucifix upon the stool, one of the executioners took from her neck the Agnus Dei, which she, laying hands off it, gave to one of her women, and told the executioner, he should be answered money for it. Then she suffered them, with her two women, to disrobe her of her chain of pomander beads and all other apparel most willingly, and with joy rather than sorrow, helped to make unready herself, putting on a pair of sleeves with her own hands which they had pulled off, and that with some haste, as if she had longed to be gone. "All this time they were pulling off her apparel, she never changed her countenance, but with smiling cheer she uttered these words, 'that she never had such grooms to make her unready, and that she never put off her clothes before such a company. "Then she, being stripped of all her apparel saving her petticoat and kirtle, her two women beholding her made great lamentation, and crying and crossing themselves prayed in Latin. She, turning herself to them, embracing them, said these words in French, 'Ne crie vous, j'ay prome pour vous', and so crossing and kissing them, bad them pray for her and rejoice and not weep, for that now they should see an end of all their mistress's troubles. "Then she, with a smiling countenance, turning to her men servants, as Melvin and the rest, standing upon a bench nigh the scaffold, who sometime weeping, sometime crying out aloud, and continually crossing themselves, prayed in Latin, crossing them with her hand bade them farewell, and wishing them to pray for her even until the last hour. "This done, one of the women have a Corpus Christi cloth lapped up three-corner-ways, kissing it, put it over the Queen of Scots' face, and pinned it fast to the caule of her head. Then the two women departed from her, and she kneeling down upon the cushion most resolutely, and without any token or fear of death, she spake aloud this Psalm in Latin, In Te Domine confido, non confundar in eternam, etc. Then, groping for the block, she laid down her head, putting her chin over the block with both her hands, which, holding there still, had been cut off had they not been espied. Then lying upon the block most quietly, and stretching out her arms cried, In manus tuas, Domine, etc., three or four times. Then she, lying very still upon the block, one of the executioners holding her slightly with one of his hands, she endured two strokes of the other executioner with an axe, she making very small noise or none at all, and not stirring any part of her from the place where she lay: and so the executioner cut off her head, saving one little gristle, which being cut asunder, he lift up her head to the view of all the assembly and bade God save the Queen. Then, her dress of lawn (her wig) from off her head, it appeared as grey as one of threescore and ten years old, polled very short, her face in a moment being so much altered from the form she had when she was alive, as few could remember her by her dead face. Her lips stirred up and a down a quarter of an hour after her head was cut off. Mary Stuart wrote this letter to her former brother-in-law, King Henry III of France just 6 hours before her execution at Fotheringhay Castle. Here Mary writes that she is dying as a martyr to her Catholic faith, & she expresses concern for the loyal servants who joined her English imprisonment. "Royal brother, having by God's will, for my sins I think, thrown myself into the power of the Queen my cousin, at whose hands I have suffered much for almost twenty years, I have finally been condemned to death by her and her Estates. I have asked for my papers, which they have taken away, in order that I might make my will, but I have been unable to recover anything of use to me, or even get leave either to make my will freely or to have my body conveyed after my death, as I would wish, to your kingdom where I had the honor to be queen, your sister and old ally. "Tonight, after dinner, I have been advised of my sentence: I am to be executed like a criminal at eight in the morning. I have not had time to give you a full account of everything that has happened, but if you will listen to my doctor and my other unfortunate servants, you will learn the truth, and how, thanks be to God, I scorn death and vow that I meet it innocent of any crime, even if I were their subject. The Catholic faith and the assertion of my God-given right to the English crown are the two issues on which I am condemned, and yet I am not allowed to say that it is for the Catholic religion that I die, but for fear of interference with theirs. The proof of this is that they have taken away my chaplain, and although he is in the building, I have not been able to get permission for him to come and hear my confession and give me the Last Sacrament, while they have been most insistent that I receive the consolation and instruction of their minister, brought here for that purpose. The bearer of this letter and his companions, most of them your subjects, will testify to my conduct at my last hour. It remains for me to beg Your Most Christian Majesty, my brother-in-law and old ally, who have always protested your love for me, to give proof now of your goodness on all these points: firstly by charity, in paying my unfortunate servants the wages due them - this is a burden on my conscience that only you can relieve: further, by having prayers offered to God for a queen who has borne the title Most Christian, and who dies a Catholic, stripped of all her possessions. As for my son, I commend him to you in so far as he deserves, for I cannot answer for him. I have taken the liberty of sending you two precious stones, talismans against illness, trusting that you will enjoy good health and a long and happy life. Accept them from your loving sister-in-law, who, as she dies, bears witness of her warm feeling for you. Again I commend my servants to you. Give instructions, if it please you, that for my soul's sake part of what you owe me should be paid, and that for the sake of Jesus Christ, to whom I shall pray for you tomorrow as I die, I be left enough to found a memorial mass and give the customary alms.Wednesday, at two in the morning, Your most loving and most true sister, Mary R"
Queen Elizabeth I sent a letter, King James VI of Scotland just 4 days after the execution. In it, she asserts her innocence in his mother's death. "My dear Brother, I would you knew (though not felt) the extreme dolor that overwhelms my mind, for that miserable accident which (far contrary to my meaning) hath befallen. I have now sent this kinsman of mine, whom ere now it hath pleased you to favour, to instruct you truly of that which is too irksome for my pen to tell you. I beseech you that as God and many more know, how innocent I am in this case : so you will believe me, that if I had bid aught I would have bid by it. I am not so base minded that fear of any living creature or Prince should make me so afraid to do that were just; or done, to deny the same. I am not of so base a lineage, nor carry so vile a mind. But, as not to disguise, fits not a King, so will I never dissemble my actions, but cause them show even as I meant them. Thus assuring yourself of me, that as I know this was deserved, yet if I had meant it I would never lay it on others' shoulders; no more will I not damnify myself that thought it not. "The circumstance it may please you to have of this bearer. And for your part, think you have not in the world a more loving kinswoman, nor a more dear friend than myself; nor any that will watch more carefully to preserve you and your estate. And who shall otherwise persuade you, judge them more partial to others than you. And thus in haste I leave to trouble you: beseeching God to send you a long reign. 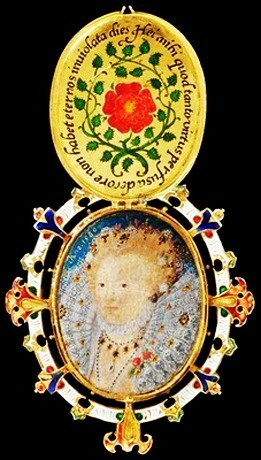 Your most assured loving sister and cousin, Elizabeth R."
1570-75 Queen Elizabeth I The Phoenix Jewel by an Unknown Artist, c.1570-75. The United States Department of Labor tell us that Labor Day, the first Monday in September, is a creation of the labor movement and is dedicated to the social and economic achievements of American workers. It constitutes a yearly national tribute to the contributions workers have made to the strength, prosperity, and well-being of the country. Who Was the Founder of Labor Day? More than 100 years after the first Labor Day observance, there is still some doubt as to who first proposed the holiday for workers. Some records show that Peter J. McGuire, general secretary of the Brotherhood of Carpenters and Joiners and a cofounder of the American Federation of Labor, was first in suggesting a day to honor those "who from rude nature have delved and carved all the grandeur we behold." But Peter McGuire's place in Labor Day history has not gone unchallenged. Many believe that Matthew Maguire, a machinist, not Peter McGuire, founded the holiday. Recent research seems to support the contention that Matthew Maguire, later the secretary of Local 344 of the International Association of Machinists in Paterson, N.J., proposed the holiday in 1882 while serving as secretary of the Central Labor Union in New York. What is clear is that the Central Labor Union adopted a Labor Day proposal and appointed a committee to plan a demonstration and picnic. The first Labor Day holiday was celebrated on Tuesday, September 5, 1882, in New York City, in accordance with the plans of the Central Labor Union. The Central Labor Union held its second Labor Day holiday just a year later, on September 5, 1883. 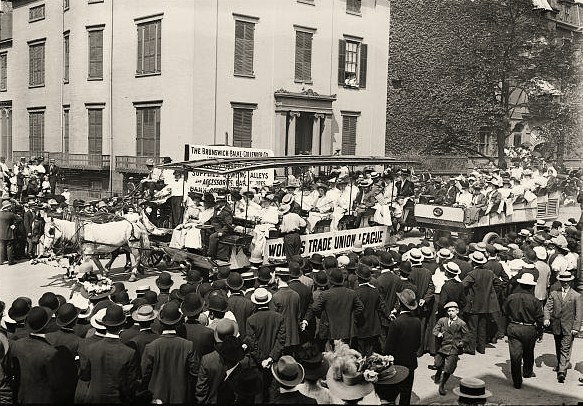 In 1884 the first Monday in September was selected as the holiday, as originally proposed, and the Central Labor Union urged similar organizations in other cities to follow the example of New York and celebrate a "workingmen's holiday" on that date. The idea spread with the growth of labor organizations, and in 1885 Labor Day was celebrated in many industrial centers of the country. Through the years the nation gave increasing emphasis to Labor Day. The first governmental recognition came through municipal ordinances passed during 1885 and 1886. From them developed the movement to secure state legislation. The first state bill was introduced into the New York legislature, but the first to become law was passed by Oregon on February 21, 1887. During the year four more states — Colorado, Massachusetts, New Jersey, and New York — created the Labor Day holiday by legislative enactment. By the end of the decade Connecticut, Nebraska, and Pennsylvania had followed suit. By 1894, 23 other states had adopted the holiday in honor of workers, and on June 28 of that year, Congress passed an act making the first Monday in September of each year a legal holiday in the District of Columbia and the territories. 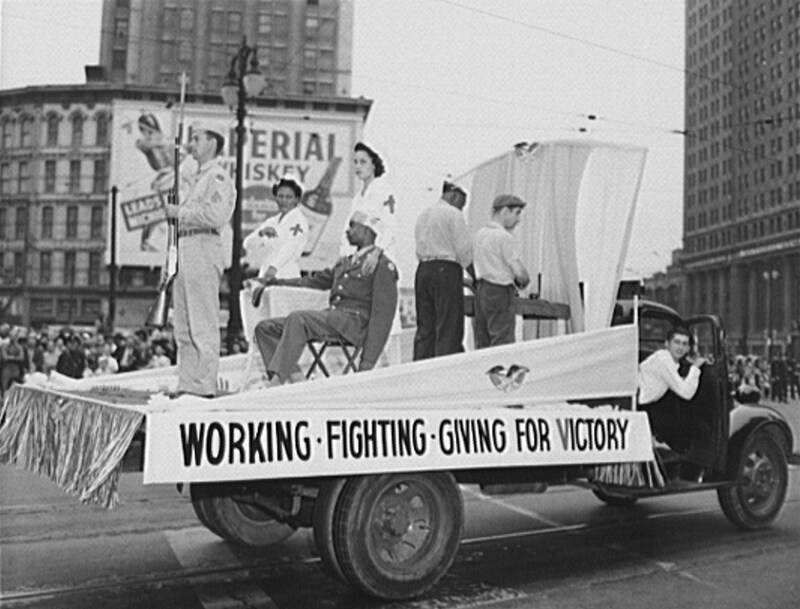 The form that the observance and celebration of Labor Day should take were outlined in the first proposal of the holiday — a street parade to exhibit to the public "the strength and esprit de corps of the trade and labor organizations" of the community, followed by a festival for the recreation and amusement of the workers and their families. This became the pattern for the celebrations of Labor Day. Speeches by prominent men and women were introduced later, as more emphasis was placed upon the economic and civic significance of the holiday. 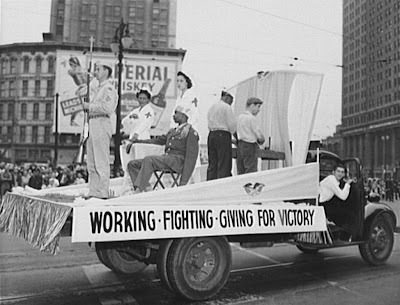 Still later, by a resolution of the American Federation of Labor convention of 1909, the Sunday preceding Labor Day was adopted as Labor Sunday and dedicated to the spiritual and educational aspects of the labor movement. 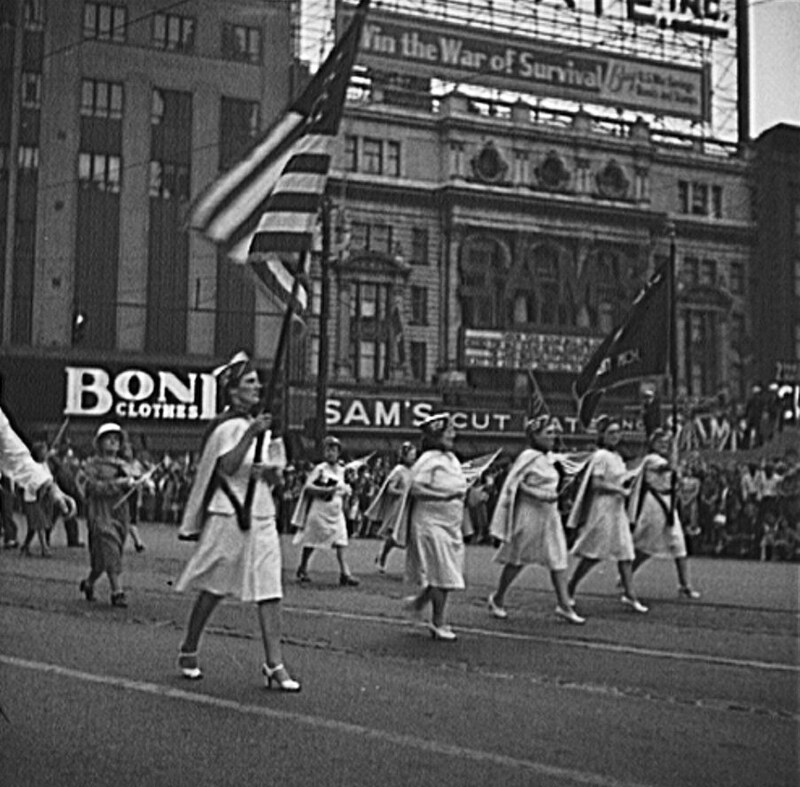 Labor Day was important for women who organized & took part in parades and celebrations. It honored women laborers during World War II, who took the place of men in the American workforce, as they were deployed around the world. 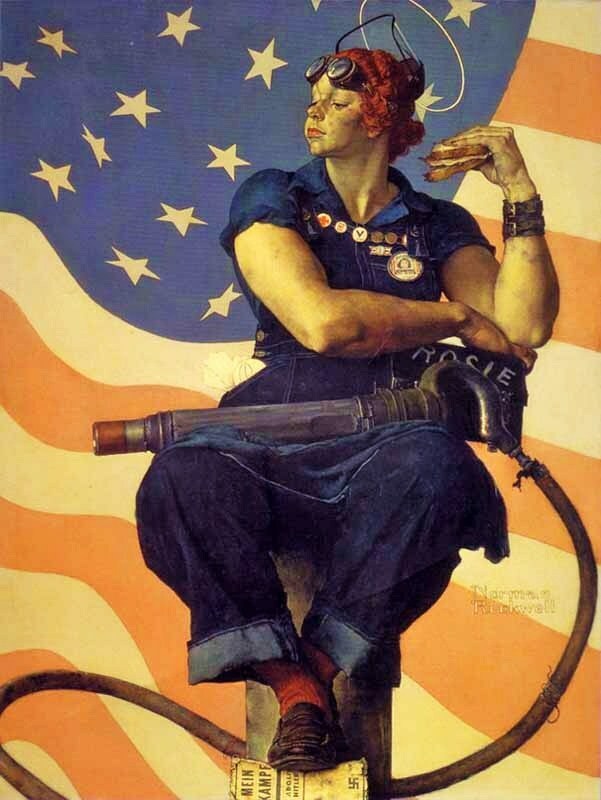 World War II's Rosie the Riveter was a real woman, Rose Will Monroe, who was born in Pulaski County, Kentucky in 1920, and moved to Michigan during World War II. She worked as a riveter at the Willow Run Aircraft Factory in Ypsilanti, Michigan, building B-29 and B-24 bombers for the U.S. Army Air Forces. The character of the Labor Day celebration has undergone a change in recent years, especially in large industrial centers where mass displays and huge parades have proved a problem. This change, however, is more a shift in emphasis and medium of expression. Labor Day addresses by leading union officials, industrialists, educators, clerics and government officials are given wide coverage in newspapers, radio, and television. 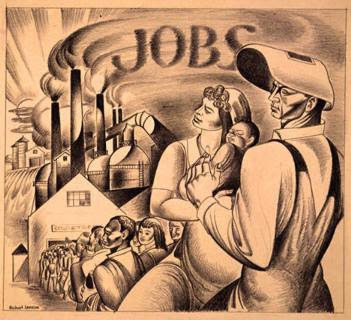 The vital force of labor added materially to the highest standard of living and the greatest production the world has ever known and has brought us closer to the realization of our traditional ideals of economic and political democracy. It is appropriate, therefore, that the nation pay tribute on Labor Day to the creator of so much of the nation's strength, freedom, and leadership — the American worker. 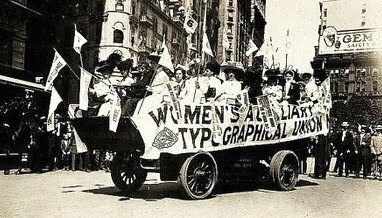 Women Organizing in the 19th Century compiled by the I Am Woman blog. 1824 Women workers strike for the first time in history at Pawtucket, Rhode Island. 102 women workers strike in support of brother weavers protesting the simultaneous reduction in wages and extension of the workday. 1825 'The United Tailoresses of New York' is formed. It is the first union for women only. 1831 In February of this year, almost 1600 women, all members of the United Tailoresses of New York, strike for "a just price for our labor." 1845 The 'Female Labor Reform Association' is formed in Lowell, Massachusetts by Sarah Bagley and other women cotton mill workers to reduce the work day from 12 or 13 hours a day to 10, and to improve sanitation and safety in the mills where they worked. 1853 Antoinette Brown becomes the first U.S. woman to be ordained as a Protestant minister. 1867 Cigar makers are the first national union to accept women and African Americans. 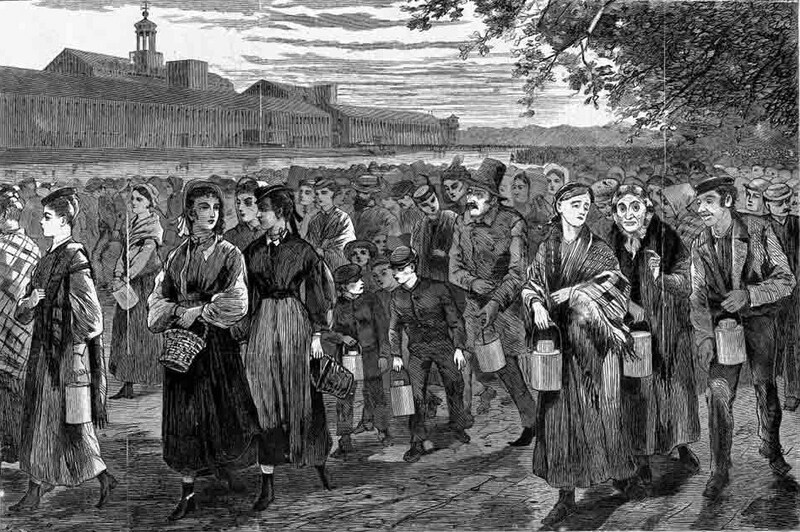 1869 In July, women shoemakers form the 'Daughters of St. Crispin', the first national union of women workers, at Lynn, Massachusetts. 1872 Congress passes a law giving women federal employee equal pay for equal work. 1881 In Atlanta, Georgia almost 3,000 black women laundry workers stage one of the largest and most effective strikes in the history of the south. 1888 Suffragists win passage of a law requiring women doctors for women patients in mental institutions. 1889 Jane Adams founds Hull House in Chicago to assist the poor. It becomes a model for many other settlement houses and establishes social work as a profession for women. 1892 Mary Kenney O'Sullivan of the Bindery Workers is appointed the AFL's first female national organizer. 1898 Charlotte Perkins Gillman wrote 'Women and Economics' which argues that women need to be economically independent. 1899 The National Consumers League is formed with Florence Kelley as its president. The League organizes women to use their power as consumers to push for better working conditions and protective law for women workers. 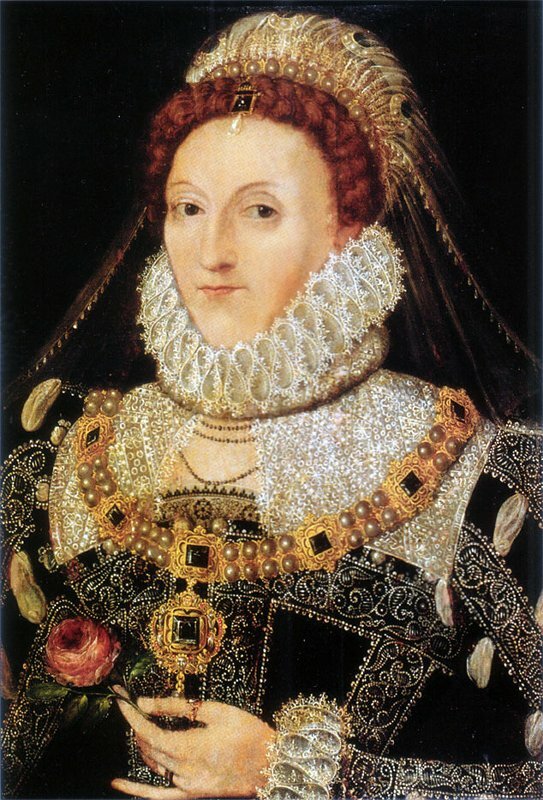 Elizabeth's fiscal restraint cleared the regime of debt by 1574. 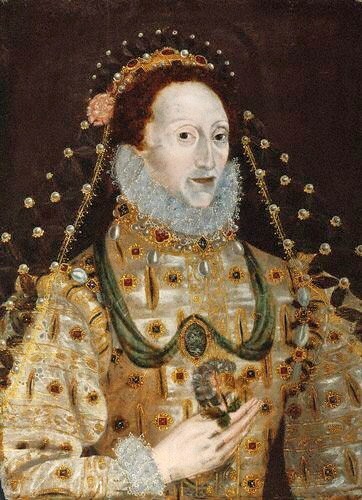 Perhaps it was this & her decision to up her public image that prompted her, in the summer of 1574, to decide to issue sumptuary laws for all the subjects of England. These laws certainly coincided with the Queen's adoption of a more glamorous public image. She was not the 1st monarch to issue such mandates, these sorts of laws had been enacted in many centuries & countries. 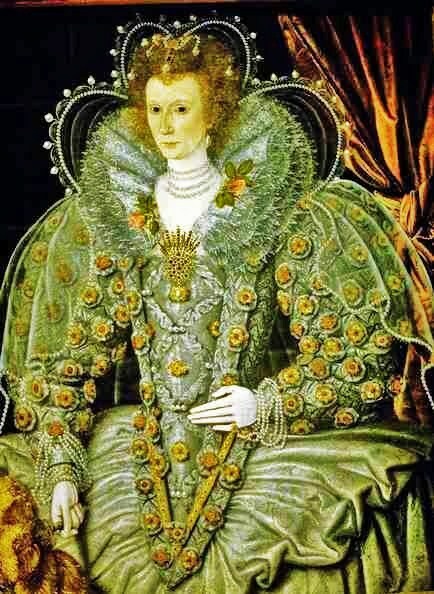 Elizabeth I intended these laws to restrict the sumptuousness of dress in order to curb extravagance, protect fortunes, & make clear the necessary & appropriate distinctions between levels of society. 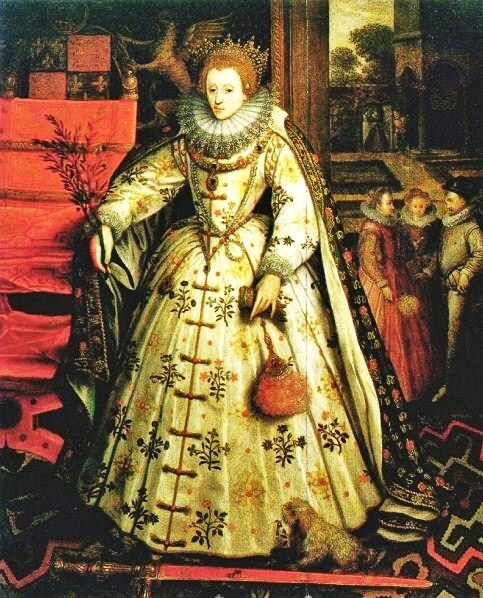 Elizabeth I decided that money spent on frivolous display would be better spent on the state of more important things, such as horses, critical to a society always in peril from its neighbors. Her other concern was that letting anyone wear just anything must lead inexorably to moral decline. If you couldn't tell a milkmaid from a countess at a glance, the very fabric of a heirarchical society might unravel. And her position & authority might be in question. 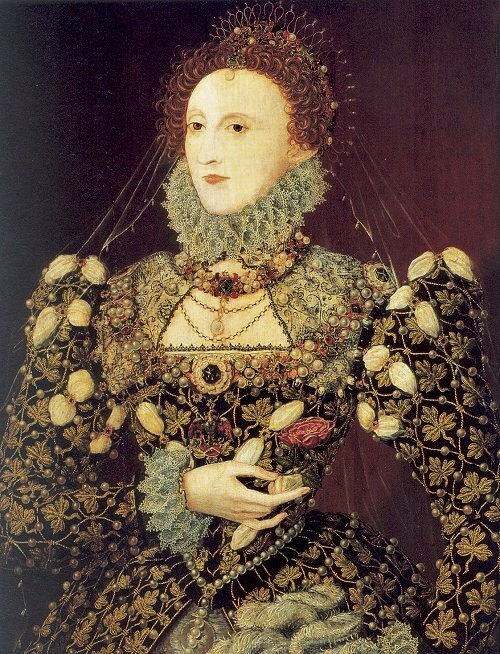 c 1575 Queen Elizabeth I 1533-1603 The Pelican Portrait, att to Nicholas Hilliard. 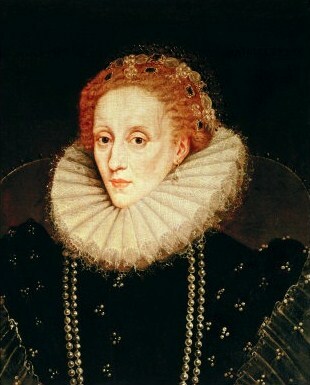 "Which great abuses, tending both to so manifest a decay of the wealth of the realm and to the ruin of a multitude of serviceable young men and gentlemen and of many good families, the Queen's majesty hath of her own princely wisdom so considered as she hath of late with great charged to her council commanded the same to be presently and speedily remedied both in her own court and in all other places of her realm, according to the sundry good laws heretofore provided. 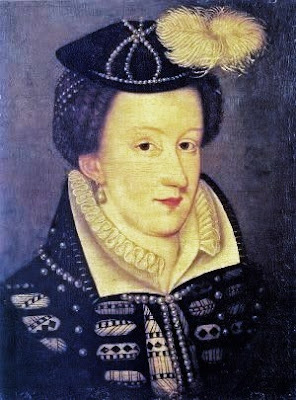 "For reformation whereof, although her highness might take great advantage and profit by execution of the said laws and statutes, yet of her princely clemency her majesty is content at this time to give warning to her loving subjects to reform themselves, and not to extend forthwith the rigor of her laws for the offences heretofore past, so as they shall now reform themselves according to such orders as at this present, jointly with this proclamation, are set forth, whereby the statute of the 24th year of her majesty's most noble father King Henry VIII and the statute made in the second year of her late dear sister Queen Mary are in some part moderated according to this time. "Wherefore her majesty willeth and straightly commandeth all manner of persons in all places within 12 days after the publication of this present proclamation to reform their apparel according to the tenor of certain articles and clauses taken out of the said statutes and with some moderations annexed to this proclamation, upon pain of her highness's indignation, and punishment for their contempts, and such other pains as in the said several statutes be expressed. c 1575 Queen Elizabeth I 1533-1603 The Phoenix Portrait, att to Nicholas Hilliard. "For the execution of which orders her majesty first giveth special charge to all such as do bear office within her most honorable house to look unto it, each person in his degree and office, that the said articles and orders be duly observed, and the contrary reformed in her majesty's court by all them who are under their office, thereby to give example to the rest of the realm; and further generally to all noblemen, of what estate or degree soever they be, and all and every person of her privy council, to all archbishops and bishops, and to the rest of the clergy according to their degrees, that they do see the same speedily and duly executed in their private households and families; and to all mayors and other head officers of cities, towns, and corporations, to the chancellors of the universities, to governors of colleges, to the ancients and benchers in every the Inns of Court and Chancery, and generally to all that hath any superiority or government over and upon any multitude, and each man in his own household for their children and servants, that they likewise do cause the said orders to be kept by all lawful means that they can. "And to the intent the same might be better kept generally throughout all the realm, her majesty giveth also special charge to all justices of the peace to inquire of the defaults and breaking of those orders in their quarter sessions, and to see them redressed in all open assemblies by all wise, godly, and lawful means; and also to all Justices of Assizes in their circuits to cause inquiry and due presentment to be made at their next assizes how these orders be kept; and so orderly, twice a year at every assize after each other circuits done, to certify in writing to her highness's Privy Council under their hands, with as convenient speed as they may, what hath been found and done as well by the justices of the peace in their quarter sessions, of whom they shall take their certificate for each quarter session, as also at the assizes, for the observing of the said orders and reformation of the abuses. "A brief content of certain clauses of the statute of King Henry VIII and Queen Mary, with some moderation thereof, to be observed according to her majesty's proclamation above mentioned." 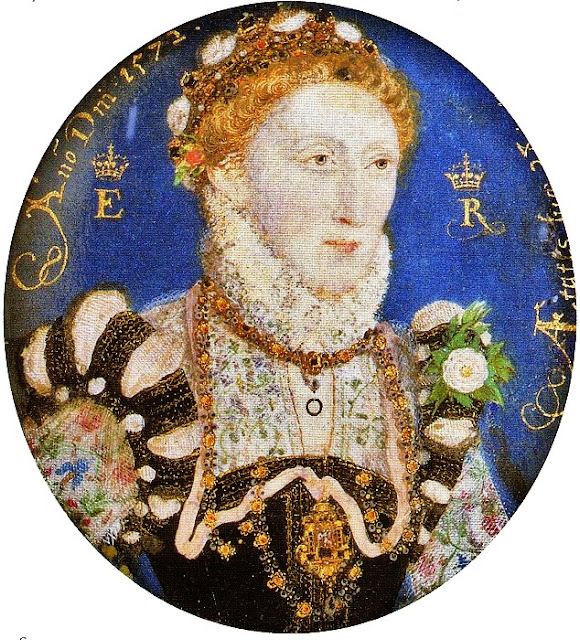 c 1575 Queen Elizabeth I 1533-1603 The Darnley Portrait, by an unknown artist. "Any cloth of gold, tissue, nor fur of sables: except duchesses, marquises, and countesses in their gowns, kirtles, partlets, and sleeves; cloth of gold, silver, tinseled satin, silk, or cloth mixed or embroidered with gold or silver or pearl, saving silk mixed with gold or silver in linings of cowls, partlets, and sleeves: except all degrees above viscountesses, and viscountesses, baronesses, and other personages of like degrees in their kirtles and sleeves. "Velvet (crimson, carnation); furs (black genets, lucerns); embroidery or passment lace of gold or silver: except all degrees above mentioned, the wives of knights of the Garter and of the Privy Council, the ladies and gentlewomen of the privy chamber and bedchamber, and maids of honor. "None shall wear any velvet in gowns, furs of leopards, embroidery of silk: except the degrees and persons above mentioned, the wives of barons' sons, or of knights. "Cowls, sleeves, partlets, and linings, trimmed with spangles or pearls of gold, silver, or pearl; cowls of gold or silver, or of silk mixed with gold or silver: except the degrees and persons above mentioned; and trimmed with pearl, none under the degree of baroness or like degrees. "Enameled chains, buttons, aglets, and borders: except the degrees before mentioned. "Satin, damask, or tufted taffeta in gowns, kirtles, or velvet in kirtles; fur whereof the kind groweth not within the Queen's dominions, except foins, grey genets, bodge, and wolf: except the degrees and persons above mentioned, or the wives of those that may dispend £100 by the year and so valued in the subsidy book. "Gowns of silk grosgrain, doubled sarcenet, camlet, or taffeta, or kirtles of satin or damask: except the degrees and persons above mentioned, and the wives of the sons and heirs of knights, and the daughters of knights, and of such as may dispend 300 marks by the year so valued ut supra, and the wives of those that may dispend £40 by the year. "Gentlewomen attendant upon duchesses, marquises, countesses may wear, in their liveries given them by their mistresses, as the wives of those that may dispend £100 by the year and are so valued ut supra. "None shall wear any velvet, tufted taffeta, satin, or any gold or silver in their petticoats: except wives of barons, knights of the order, or councilors' ladies, and gentlewomen of the privy chamber and bed chamber, and the maids of honor. "Damask, taffeta, or other silk in their petticoats: except knights' daughters and such as be matched with them in the former article, who shall not wear a guard of any silk upon their petticoats. "Velvet, tufted taffeta, satin, nor any gold or silver in any cloak or safeguard: except the wives of barons, knights of the order, or councilor's ladies and gentlewomen of the privy chamber and bedchamber, and maids of honor, and the degrees above them. "Damask, taffeta, or other silk in any cloak or safeguard: except knights' wives, and the degrees and persons above mentioned. "No persons under the degrees above specified shall wear any guard or welt of silk upon any petticoat, cloak, or safeguard." 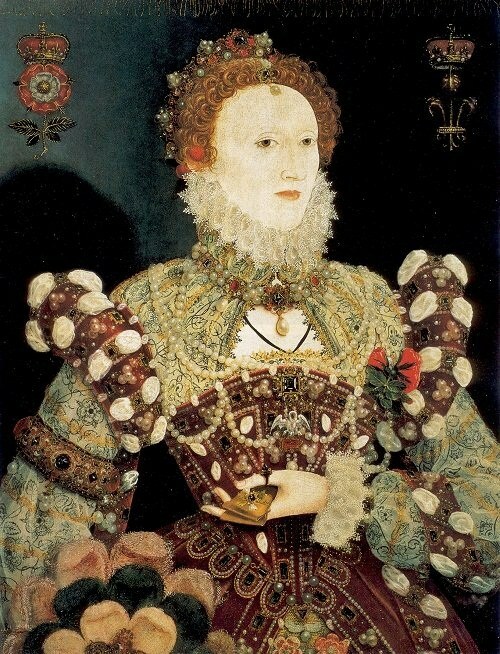 By the 1570s, Elizabeth I had been transformed into an ageless goddess. Gone were the simple, human likenesses. The queen was now an untouchable symbol of power. Roses & prayer book props were joined by tools for building an empire - swords, globes, & crowns - swirling around a timeless depiction of virginity & purity decorated with sieves, moons & pearls. 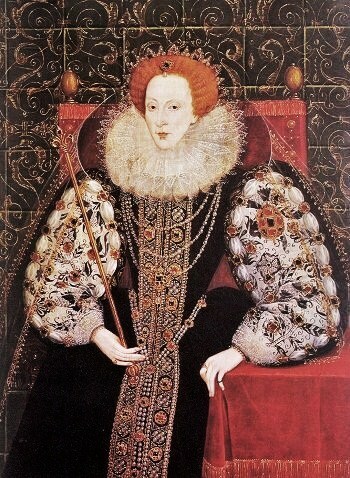 This queen was meant to be revered and to be unquestioningly followed, as she led England into the wider world. 1572 Queen Elizabeth I 1533-1603 miniature portrait on vellum playing card by Nicholas Hilliard. 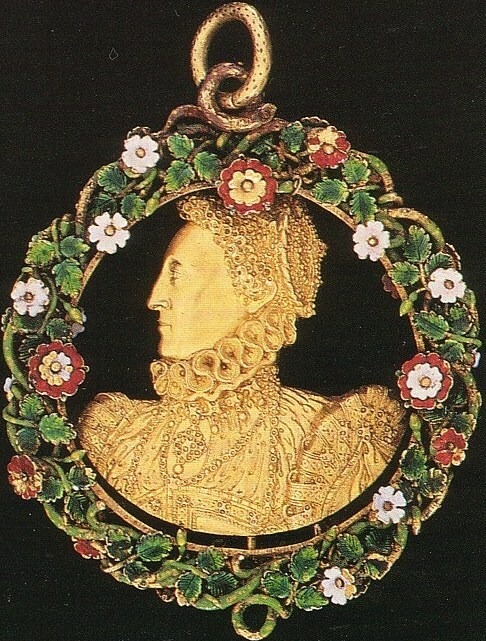 c 1575 Queen Elizabeth I 1533-1603 The Pelican Portrait, attr to Nicholas Hilliard. 1575 Queen Elizabeth I 1533-1603 The Phoenix Portrait, attr to Nicholas Hilliard. 1579 Queen Elizabeth I 1533-1603 The Plimpton Sieve Portrait by George Gover. The sieve is a symbol of chastity & purity, originally taken from Petrarch's Triumph of Chastity. In the story, a Roman Vestal Virgin proves her purity by carrying water in a sieve & not spilling one drop. 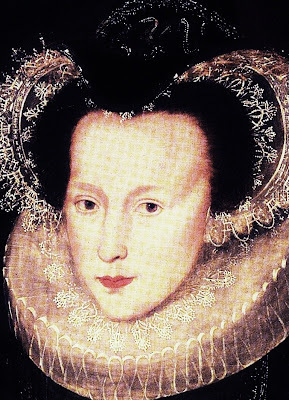 The sieve thus reinforces Elizabeth's image as "the virgin queen." 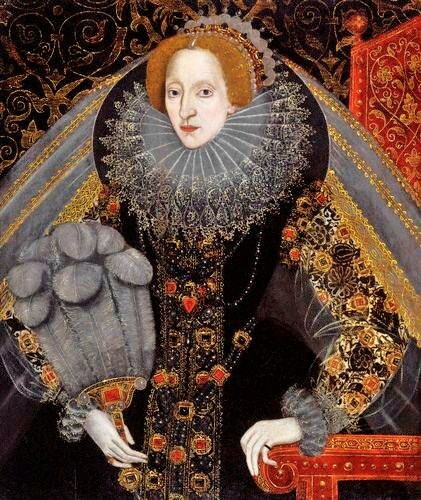 1580-85 Queen Elizabeth I 1533-1603 The Peace Portrait, 1580-5, by Marcus Gheeraerts the Elder. 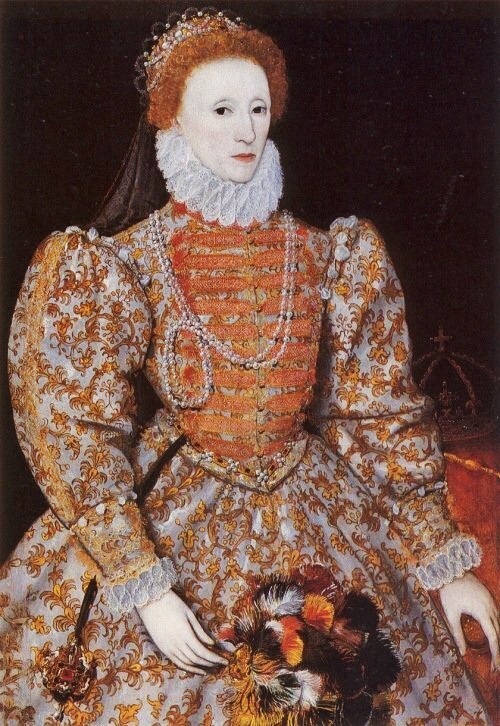 1580s Queen Elizabeth I 1533-1603 by John Bettes the Younger. 1583 Queen Elizabeth I 1533-1603 The Sieve Portrait by Quentin Metsys the Younger. 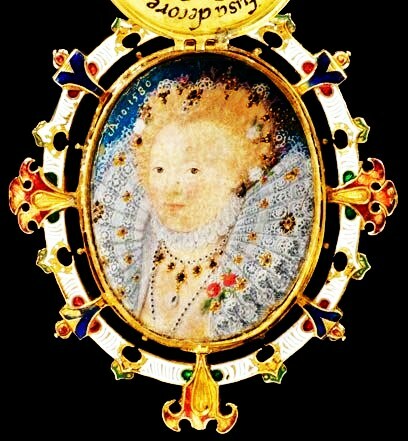 1585 Queen Elizabeth I 1533-1603 The Ermine Portrait, by Nicholas Hilliard. 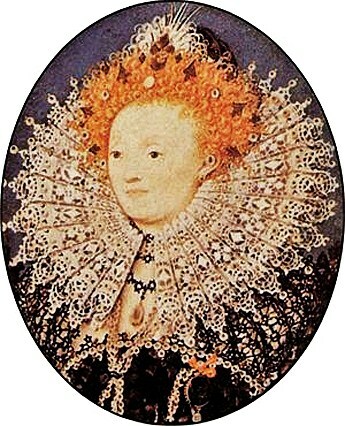 1585 Queen Elizabeth I 1533-1603 with a feather fan by an unknown artist. 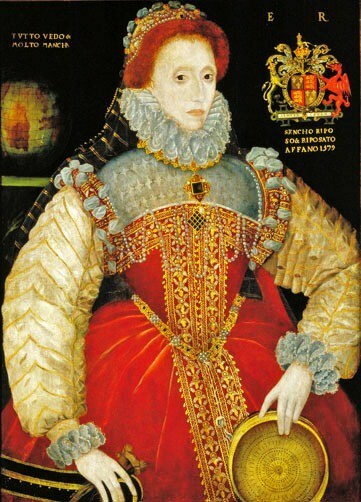 1585 Queen Elizabeth I 1533-1603 with feather fan by John Bettes the Younger. 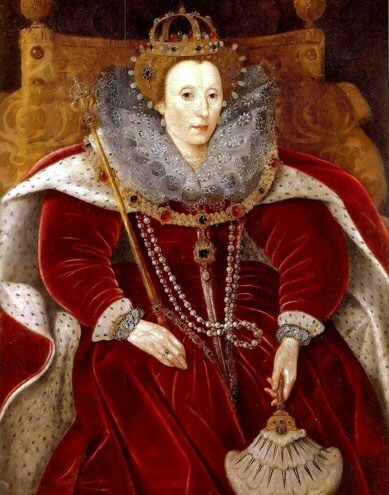 1590s Queen Elizabeth I 1533-1603 in old age, by Marcus Gheeraerts the Younger.